It probably came as a surprise to Canadians when they heard the Statistic Canada plan to access personal information from banks. The agency was planning on requiring banks to turn over the transaction history for half a million Canadians without consent or notification. As it turns out, Canadians are not in favour of allowing Statistics Canada to do so. In fact, 74% of Canadians are opposed. Only 23% support it. This is decisive opposition. Opposition to the plan is striking and Canadians reject the rationale. According to Statistics Canada, they need transaction data to improve their understanding of consumer behaviour. 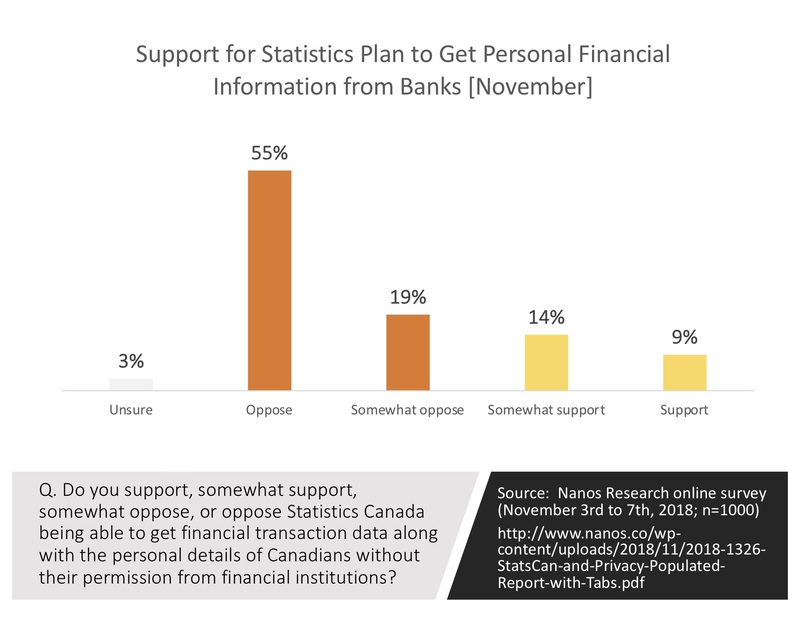 When asked about the trade off, Nanos found that 64% think that protecting the privacy of the financial information of Canadians is more important than Statistics Canada better understanding consumer behaviour and trends (24%) by more than a 2:1 margin. An interesting aside is that the public has more trust in banks. Canadians are more confident in banks than Statistics Canada to protect themselves from outside cyber attacks/data breaches. They also think banks can be more trusted to protect personal information. The plan is under review but Statistics Canada has a lot of work to do to convince the public. Privacy of personal information is an important mantra for the public.